Berkswell Rosetta, this is another cultivar with great show potential from Mal & Judi Harris. 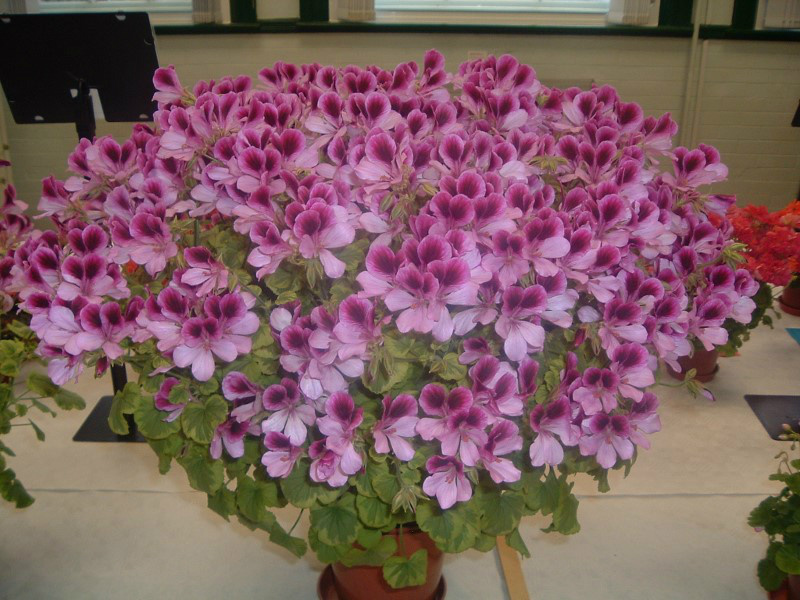 It has tight growth and hold itself well in a 6" (15.5cm) pot. Oldbury Duet, a sport of Tip Top Duet found at Oldbury Nurseries. 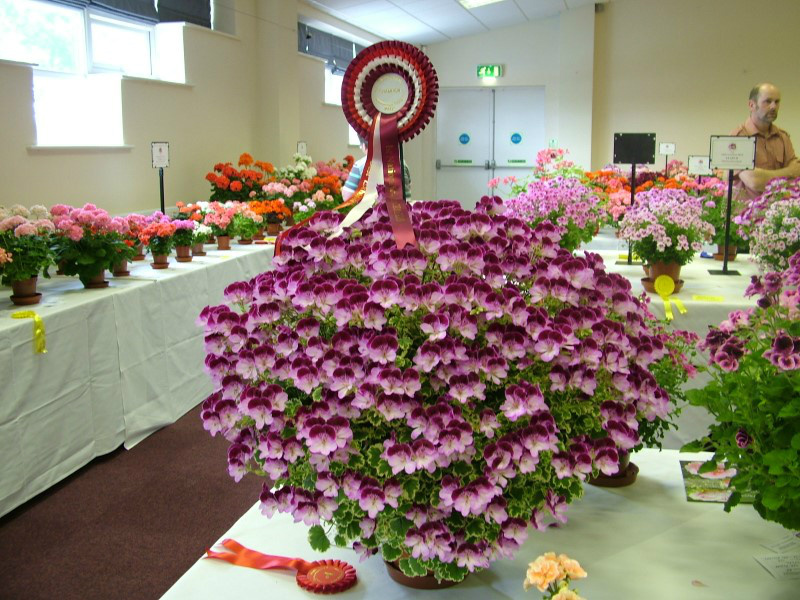 This is more compact and with the bicolour foliage makes a stunning display on the show bench. This is so short jointed that it makes a great plant in a 6" pot. The one in the photo was five years old. Not the easiest angel to root, the best time I have found is in the spring or early summer. Quantock Louise, bred by Ken Dymond. This so short jointed that it more or less shapes itself and I prefer to grow it as a dwarf in a 4.5" pot. As it is so compact I take out the growing tip at 4 sets of leaves once rooted, it then soon starts to shape itself well. Quantock Kirsty, again bred by Ken Dymond. 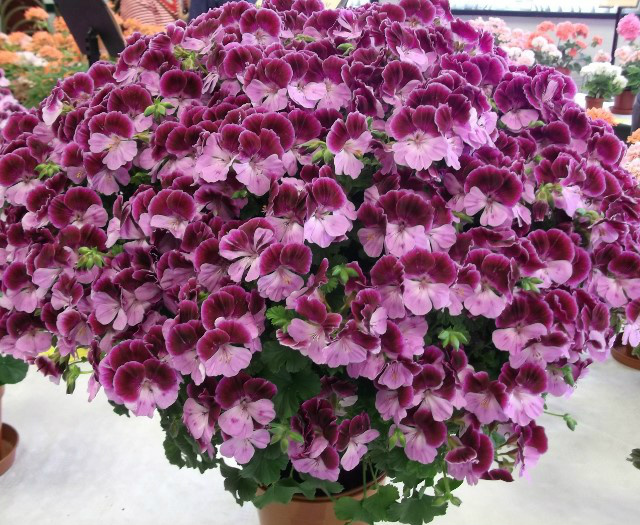 This is also short jointed and suitable for use as a dwarf or grown in a 5" pot. I would not advise for show purposes putting it into a 6" pot as I have found it opens up in the middle of the plant. This will root anytime of the year for me. 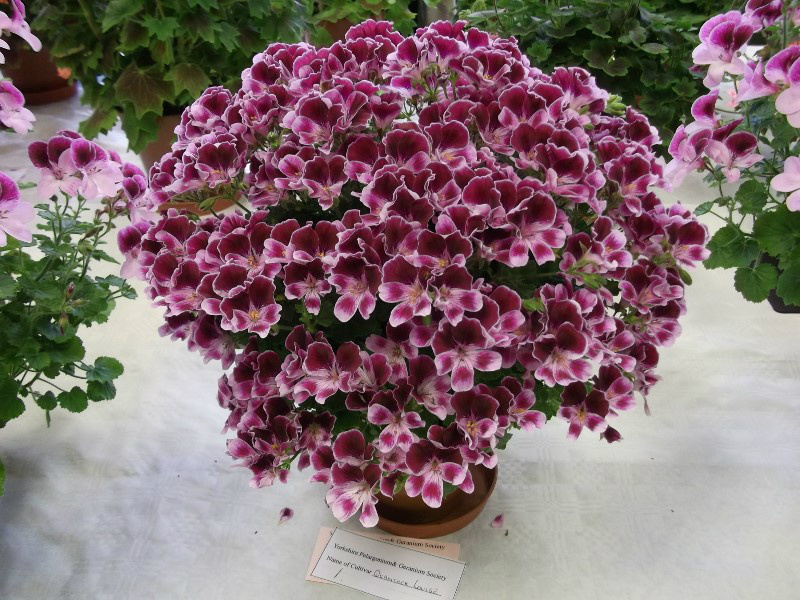 Cottenham Surprise, bred by Mervyn Haird. 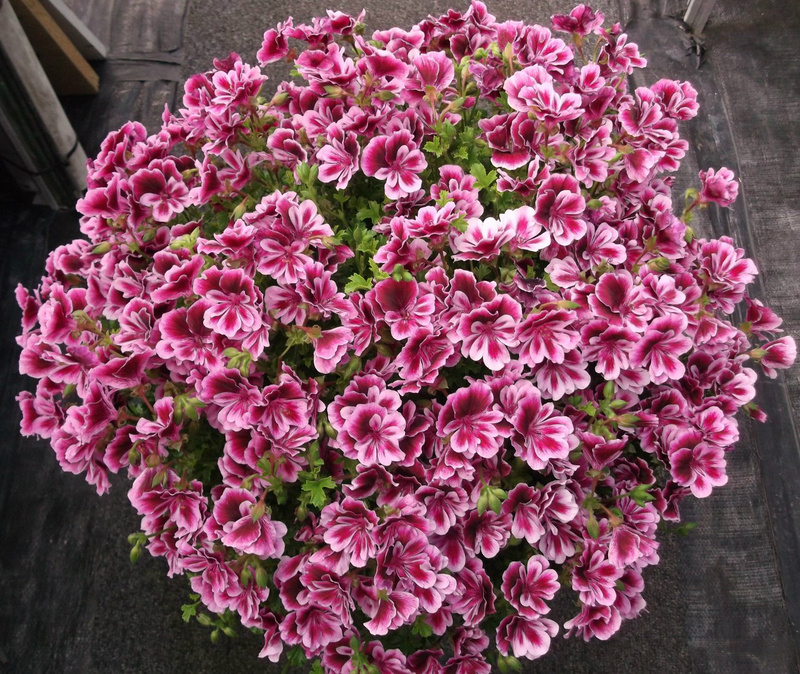 I find this strong growing and needs careful stopping to make a good plant in a 6" pot. 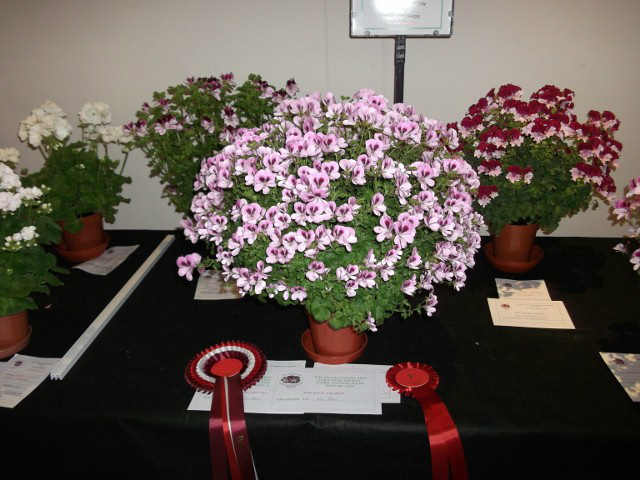 As you can see by the photo it is well worth the effort and makes a stunning display on the show bench. Sarah Don, a sport found on Darmsden by Roger Jones. Named after the wife of Monty Donn the presenter of Gardener's World. 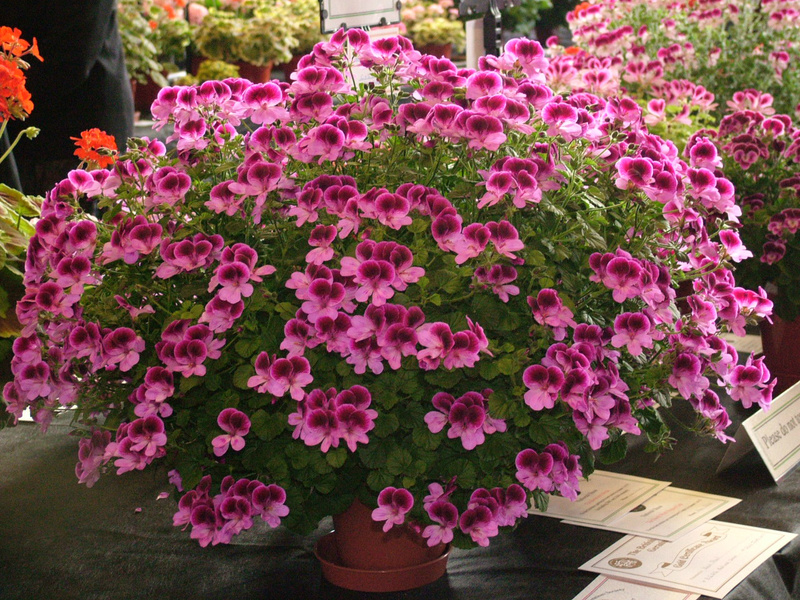 It is vigorous and can make a good show plant in a 6" pot very quickly if stopped hard to start with. As an example the one in photo is 2 years old. Starlight Magic, a seedling from Captain Starlight bred by J.Poet. The plant in the photo is 3 years old. Unfortunately I had to take as many flowers off as there were left on plant as they had gone over. I am working on building up another plant for the showbench hoping to once again emulate the size achieved. This cultivar holds itself well as it is quite short jointed and cuttings root easily.